It’s the time of year for get-togethers and feasts. Mia Anstine recommends a few wild game potluck-style recipes. There is nothing as rewarding as providing a “field to fork” meal for friends or family. The holiday season is here and one of the most difficult things, I find, is coming up with easy recipes to take to potlucks. MIa & the Little Gal is sponsored by Girls with Guns Clothing. Whether you’re the hostess and serving the main dish, or a guest bringing a side or dessert, here are a few tasty wild game recipes. Insert roasting rack into slow cooker. Add water to the crock, filling to just below the roasting rack. Preheat the slow cooker, with the lid on. Apply salt to the external and internal portions of the skinned and cleaned duck. Use your fingers or a small spoon to alternately add diced apples and onion. Fill the cavity of the duck about halfway, then insert one crushed, peeled garlic clove. Fill the cavity of the duck the remainder of the way with more apples and onion. Place the stuffed duck on the roasting rack and repeat with the remainder of the ducks. Secure the lid onto the slow cooker and cook 1 hour. After 1 hour, use tongs to remove the ducks from the slow cooker. Place them on a lined baking sheet. Place them under the broiler, on high, for 10 minutes. Remove from broiler and let the ducks rest for 15 minutes. Top with apple glaze and serve. 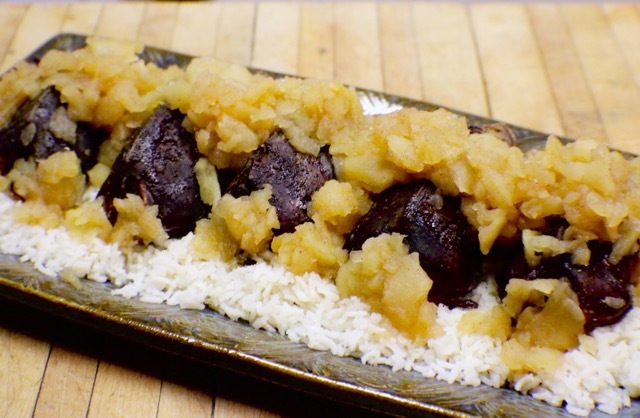 While the ducks are in the crock, make the apple glaze. In a saucepan, boil the water. Add the sliced apples to the boiling water. Add the brown sugar, white sugar, cinnamon and lemon juice. Return to a boil, reduce heat and cover the pot. Let the sauce simmer 30 minutes, then mash the apples. You can use domestic or wild turkey for this recipe. In a large stockpot, boil the turkey approximately 45 minutes, or until it falls off the bones. Remove and shred the meat. While the turkey is boiling, prepare the green chile mixture. Heat the olive oil in a large skillet. Add the onion and garlic and sauté until they are golden. Add the diced green chiles, and heat through until sizzling. Add the Rotel and reduce the heat. Let simmer 15–20 minutes. Turn the slow cooker to its high setting. Add the posole and chicken stock. Add the turkey and green chile mixture. Stir in the cumin and caldo. Salt to taste. Pour in water, filling to just below the top of the slow cooker. Secure the slow cooker’s lid and cook on high, checking periodically to ensure water doesn’t run out. 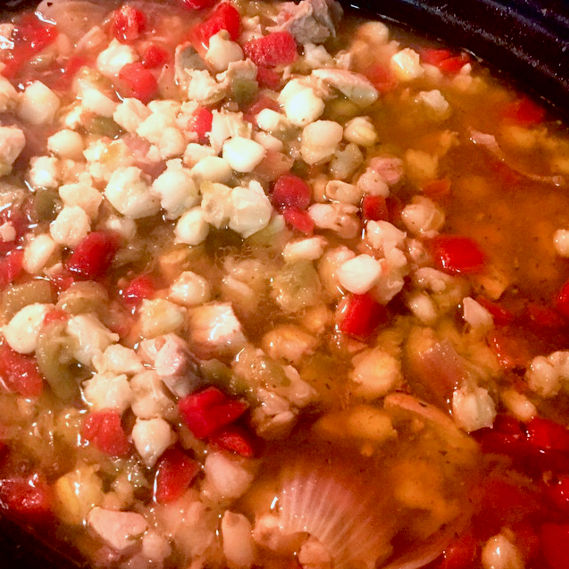 Cook until the posole kernels pop, approximately 3–4 hours. Apply a thin layer of chocolate icing to the tops of the cupcakes. Place one vanilla wafer on top of each cupcake, slightly off-center; this represents the moose’s head. Apply one dot of black icing to the center of the wafer. This will be the nose. Use the white icing to add two dots above the wafer and apply a mini chocolate chip to the center of each white dot. These are the eyes. 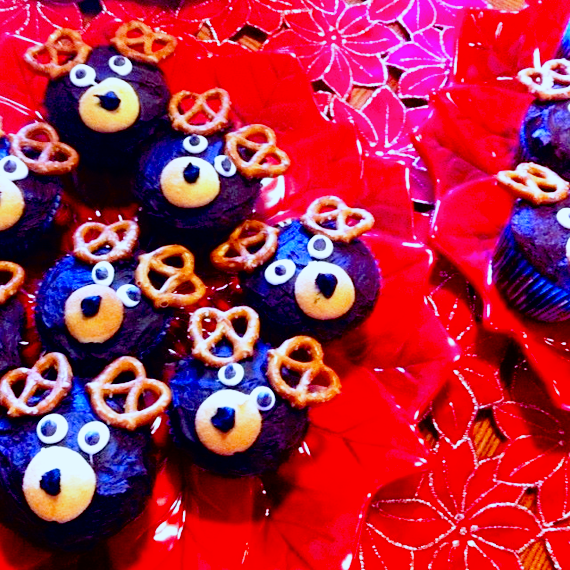 Apply the pretzels above the eyes as antlers.